Sun! Since Christmas week, we seem to be getting one sunny day a week and it looks like this is it for this week. We made the most of it with a visit, about 30 minutes down the autopista, to Villajoyosa (Spanish) or La Vila Joiosa (Valenciana). At least those two names look as if they are related and should be a little less confusing to unsuspecting tourists. 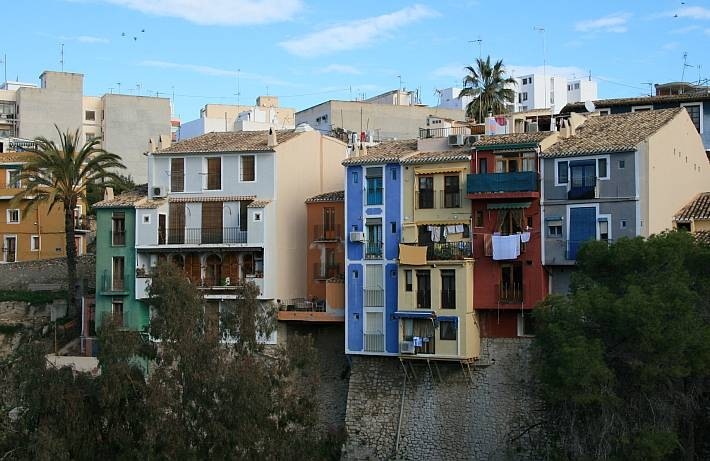 Villajoyosa is notable for its brightly and, it has to be said, inventively coloured houses. Some of the colours used are colours that, as sole examples standing against more normally white-painted houses, would jar horribly. However, since whole sections of the buildings are brightly and individually painted, everything seems to blend into a colourful harmony. 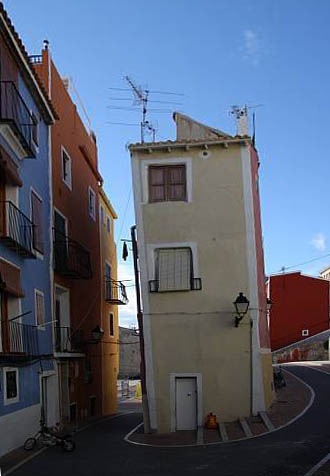 The use of colours on the buildings at Villajoyosa is said to have had an historic purpose rather than being a way to express one’s individuality, or simply to upset the neighbours. 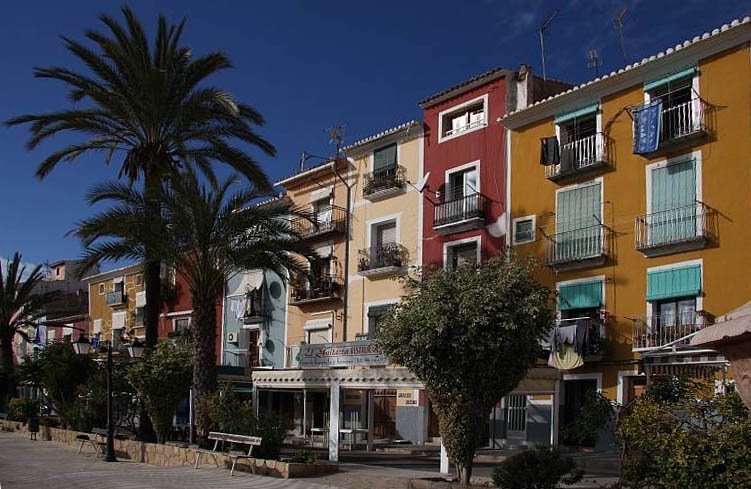 🙂 Villajoyosa is an old fishing port and the colours supposedly helped fishermen returning in bad weather to pick out their own houses. I imagine that this means they landed any catches on the beach in front of their house. That wouldn’t work, would it? We arrived and, not being afraid of a walk back to the heart of things, found a parking spot on the edge of town, then set off in search of garish buildings. On our way down to the front, we also discovered some roads that rivalled the famous Lombard Street in San Francisco in its claim to be the world’s twistiest street. The habit of using bright colours may have started with fishermens’ houses on the front but it has clearly spread. Side streets now contain some very colourful examples. After wandering around Villajoyosa and using quite a few pixels trying to capture the colourful nature of the place, a latish fish lunch began calling. Villajoyosa may have been colourful but we hadn’t spotted any enticing open fish restaurants on the front so we decided to scoot back up the autopista to Calp/Calpe, which is on the way back towards Jalón/Xaló, which does have many inviting fish restaurants surrounding its harbour. Carol, Steve and Rosemary had enjoyed a warm, sunny lunch here during my rush back to England just before Christmas. Now it was my turn. It was cool and sunny but we still sat outside and a very good menu del diá, regardless. The free plate of chiparones (baby squid – and I mean real baby squid, unlike the baby eels) were excellent. Two glasses of sangria, chiparones, battered artichokes and generous helpings of merluza a la plancha (grilled hake) together with a bottle of very reasonable vino blanco, all for €10.50 per person, including tip. Marvelous!